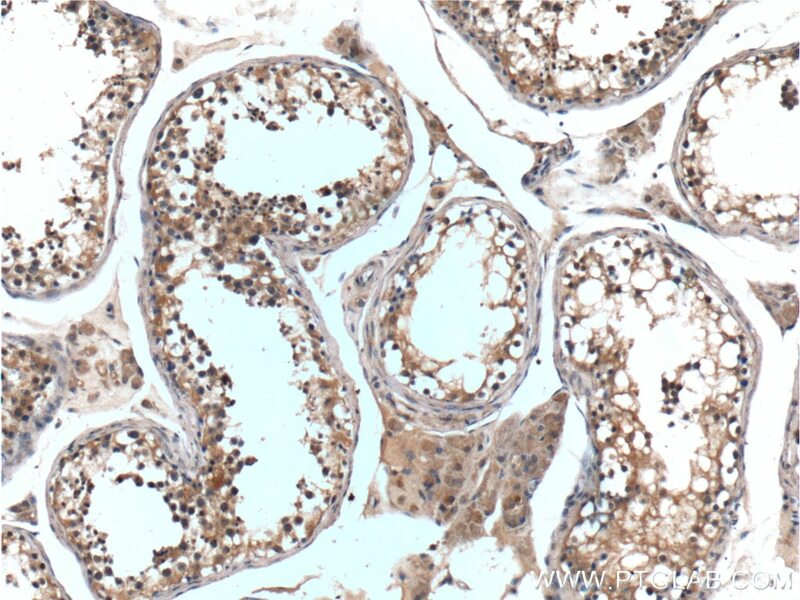 Immunohistochemical analysis of paraffin-embedded human testis tissue slide using 26967-1-AP (Bcl-XL antibody) at dilution of 1:200 (under 10x lens). 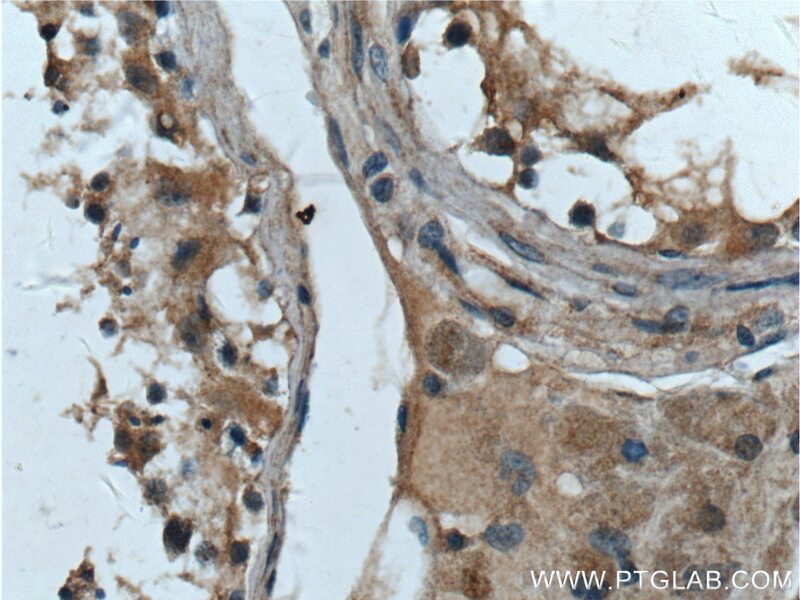 Immunohistochemical analysis of paraffin-embedded human testis tissue slide using 26967-1-AP (Bcl-XL antibody) at dilution of 1:200 (under 40x lens). BCL2L1 is a member of the BCL-2 protein family. BCL2L1 is expressed as three isoforms, Bcl-X(L),Bcl-X(s) and Bcl-X(beta), and is located at the outer mitochondrial membrane. The Bcl-XL isoform is a 233 amino acid protein, acting as an apoptotic inhibitor. Bcl-XL can forms heterodimers with BAX, BAK or BCL2, and the heterodimerization with BAX does not seem to be required for anti-apoptotic activity. The Bcl-XS isoform is a shorter variant that is 178 amino acids in length and lacks a 63 amino acid region (amino acids 126-188), acting as an apoptotic activator. 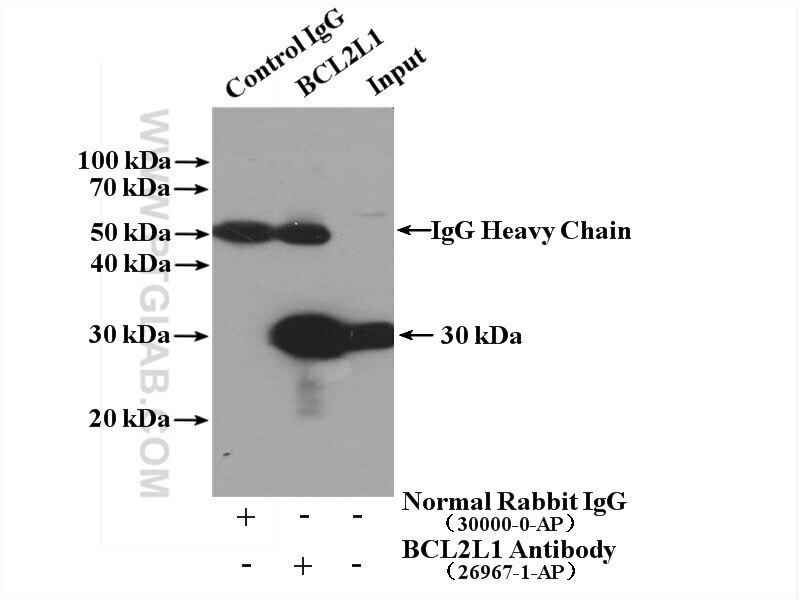 This antibody can recognize Bcl-XL, Bcl-XS and Bcl-X(Beta). 7-O-Geranylquercetin induces apoptosis in gastric cancer cells via ROS-MAPK mediated mitochondrial signaling pathway activation. Role of the lncRNA ABHD11-AS1 in the tumorigenesis and progression of epithelial ovarian cancer through targeted regulation of RhoC. LncRNA MEG3 inhibit endometrial carcinoma tumorigenesis and progression through PI3K pathway. Mcl-1 stabilization confers resistance to taxol in human gastric cancer. Long noncoding RNA LINC01234 functions as a competing endogenous RNA to regulate CBFB expression by sponging miR-204-5p in gastric cancer. T-2 toxin-induced toxicity in neuroblastoma-2a cells involves the generation of reactive oxygen, mitochondrial dysfunction and inhibition of Nrf2/HO-1 pathway. 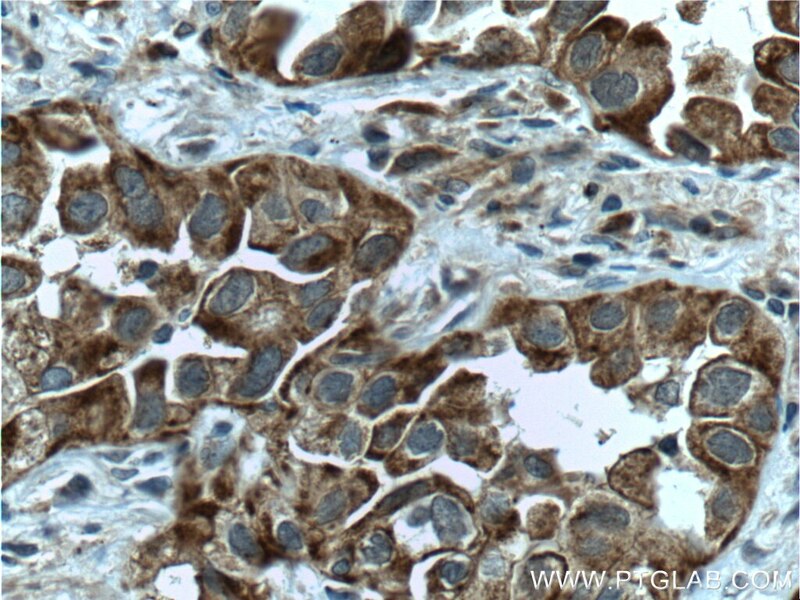 Immunohistochemical analysis of paraffin-embedded human lung cancer tissue slide using 26967-1-AP (Bcl-XL antibody) at dilution of 1:200 (under 10x lens) heat mediated antigen retrieved with Tris-EDTA buffer(pH9). 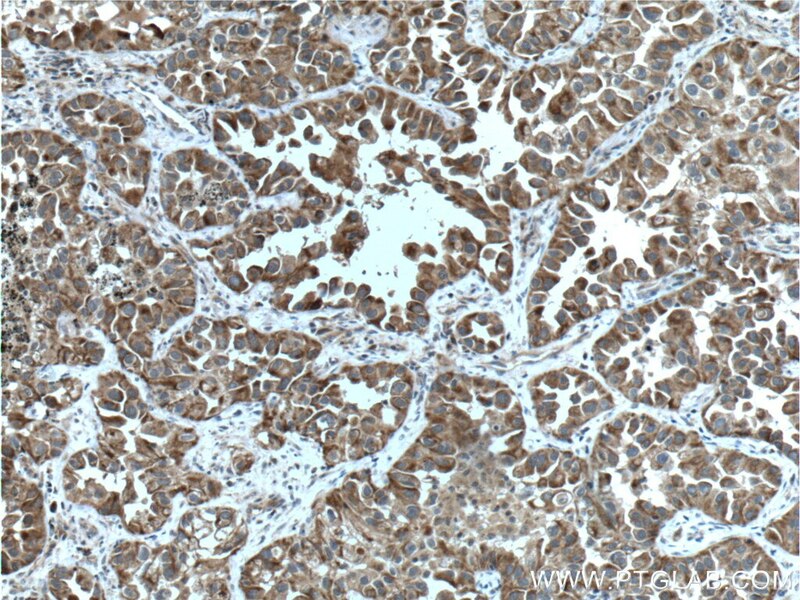 Immunohistochemical analysis of paraffin-embedded human lung cancer tissue slide using 26967-1-AP( Bcl-XL/S antibody at dilution of 1:200 (under 40x lens). heat mediated antigen retrieved with Tris-EDTA buffer(pH9).